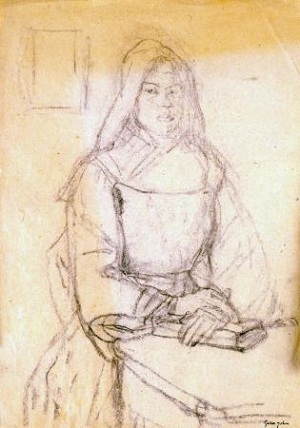 This drawing of an unknown nun is closely related to the series of portraits of Mère Poussepin Gwen John executed from 1913, one of which is shown in the Blue Gallery. The artist worked from a prayer card showing the 17th-century sister with her hands on a book. 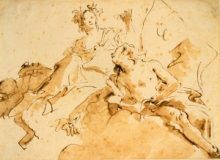 The unknown sitter here adopts the same pose, allowing the artist to study the costume and the arrangement of her hands. John varies the pose further in the completed paintings, producing a series of variations typical of her obsessive approach to the single figure. Such images reflect the artist’s passionate religious faith as a Catholic convert.